Is one of my favourite actors, and his performance in Mr Turner is a real tour de force. Many people know him for his part of Barry the Brummie in “Auf Wiedersehen Pet”, but his roots on the Spall side of his family are in South London since Victorian Times, and Suffolk before that. However the Part of his Family Tree we are interested in for a Christmas Story is Tim’s Grandmother Margaret, the reason for this? Her name was Margaret Christmas! Margaret married Tim’s Grandfather Thomas James William Spall on 27th September 1914, shortly after he had enlisted as a Driver in the Army Service Corps in WW1, he was a young widower of 24 the son of a Horse Keeper, and she was the daughter of a General Dealer, generally a catch all term for someone who bought and sold goods, probably from a barrow rather than a shop or even door to door, and this gives a glimpse of the interesting history of the Christmas Family. 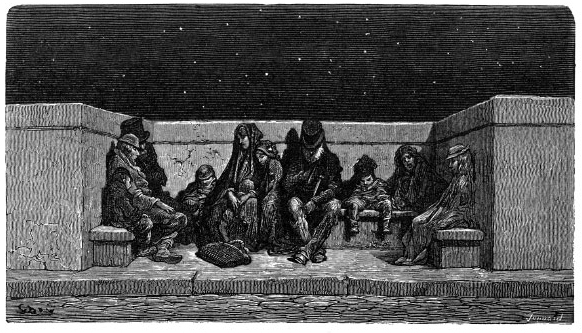 This crowding was swelled in the Winter months with semi-rural “Gypsies” British Romani Families, too poor to own their own permanent covered wagons amongst the big seasonal Romani encampments on the Hackney Marshes, they could earn money in London labouring and sleep under a roof rather than in a tent on open ground in the frost and rain. 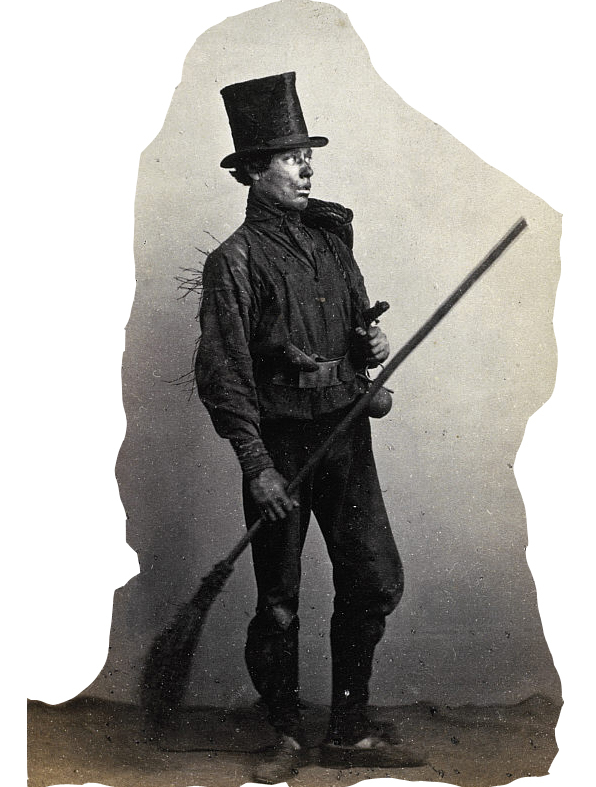 Many of the men made a living as Labourers, Sweeps, Tinkers (Tinsmiths and sellers), and street Hawkers and Pedlars, which is interesting as we find Thomas Cristmas working as a sweep, Labourer, and Tinplate Maker and Brazier, whether or not genetically a member of a Romani tribe, the Christmases were culturally closely tied to them, commercially and with some family relations. But Thomas’s family were not wide travellers, they were east End Cockneys, and when times got bad they couldn’t just take to the road when worked dried up, and this is what happened to them in the late 1820s; Thomas, Sarah and their children were forced into the workhouse, and indeed two sons, Joseph and William were born there. Thomas had little luck after that, and he died in his 50s, most likely in the workhouse. Sarah had no choice but to split the family up, Thomas the eldest boy was carrying on his Father’s Tinker trade, and although not yet married was living with a local girl, Elizabeth Davies and their daughter, called very appropriately for this season, Mary Ann Christmas. His younger brothers, John, Joseph, and William, go off to live in White’s Alley with a sweep and his family, living 8 to a couple of small rooms, and working as sweeps, the youngest at 10, the next at 13, and the eldest at 17. A bad start and tough times went through the generations, Sarah lived with her older son John the Chimney Sweep and his wife for a while, he at least seems to have moved with the times, as by 1851 he was a mechanical sweep rather than just a sweep with a brush, but after this his family and his mother drop out of the records, a bad sign for a working class family. 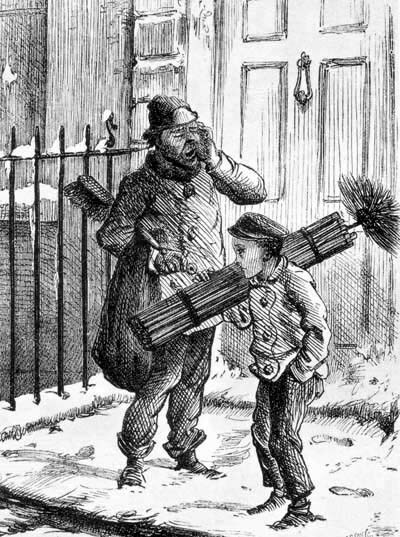 His younger brother Joseph disappears altogether after 1841, however the youngest son William survives, working as a Tinman through to the 1870s, before reverting to Chimney Sweeping again from the 1880s onwards when he moves out of the slums of Shoreditch to the relatively more salubrious area of Leyton in Essex, with his wife Isabella, both of whom survive into their 70s. 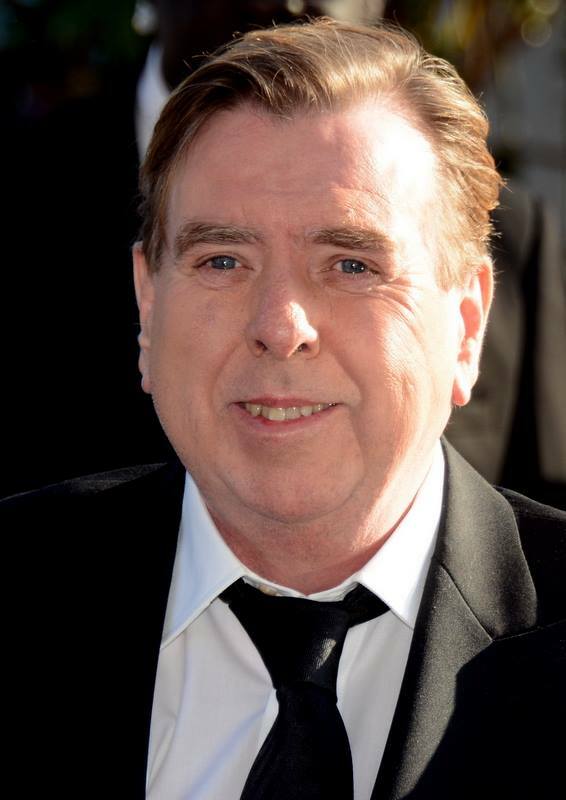 Timothy Spall’s line is however descended from the eldest surviving son, Thomas, who carries on living in the dreadful Shoreditch Spitalfields area, working as a Tinsmith and occasional street dealer, raising 7 children in the slums, the youngest of whom died at 2 years old, but whose surviving sons carried on the Tinker trade in the area, the second of whom Joseph Henry, was Timothy Spall’s Great Great Grandfather. Times were still very hard, and after living in various dark cramped and unsanitary courts, his first wife Elizabeth died at about 50 years of age, he remarried to Sarah Cordes (possibly originally of Sephardic Jewish extraction, given her surname) a girl 12 years his junior in 1859. Thomas falls out of the records in the 1860s, either because he was living in areas where census takers feared to tread (some courts and alleys were never fully recorded for the fear of life and limb faced by the census officials) or because he and his wife were sleeping rough or not properly recorded in the Workhouse registers. However he does turn up again in Bethnal Green Workhouse in 1891 where he will stay for the next 18 years until his death in 1909. Altogether a pretty grim tale for Christmas so far. But Thomas’s son Joseph Henry Christmas had a rare and unexpected stroke of luck in the late 1870s, which must have looked like a catastrophe to him when it first happened. The local corporation decided to do something about the dreadful slums of Spitalfields, to widen the local roads, and subsequently built a new church, unfortunately the first change made 800 local Cockneys homeless, and the second made another 500 homeless, 1300 Cockneys turned out into the streets, meant one of four things; you could sleep rough, you could cram your family into the already overcrowded surrounding areas, you could go to the workhouse to die slowly rather than dieing quickly on the streets, or leave the area altogether if you had the right connections and the chance to earn the right living. Joseph’s Dad, Thomas, chose the workhouse and stayed there until he died, his uncle William went to leafy Leyton, but Joseph managed to get contact with some related country members of the more itinerant arm of the Christmas Family, possibly through the better educated branches of the family in Shoreditch who had found religion in Methodism, and had children who were educated enough to find white collar work in the Post Office, Railway, and by the Gas Works in that foreign land south of the River of Battersea. There are a smattering of educated Christmases in the Wandsworth area at the time, those whose parents originated in Westminster and Shoreditch, alongside our Christmas family, as well as a number of Christmases who had drifted up to Wandsworth Common from Hampshire, as part of the South of the Thames Romanies camped in Wandsworth the same way that their cousins from North of the River camped in Hackney. And like the northern branch, the less Wagon tied families would move further into town to work in the Gas companies and railways, who were crying out for labour, so work was guaranteed, and in the Gas works in particular, the “worst work” was at least inside, and in many cases in warm if not hot conditions, which the Transpontine (South of the Bridge/River) Cockney/Gypsies thrived on, compared to the man killing cold of living and working in the open. Sure enough the Christmases from Hampshire are working in the gas works in Wandsworth, when over comes Joseph Henry in 1881 when he, his wife Cora, and their six children are kicked out of the slums to make way for the Road and Church (The Lord moves in mysterious ways indeed?). This is the start of the take over of a small set of streets in between the gasworks, railway depots, and the Thames by the Tinker Christmases. Once Joseph Henry and Cora were settled they never moved further than between one of three Roads in the area, Ponton Rd, Belfour St, and Everett St. This little enclave off Nine Elms Lane, within spitting distance of the Thames wharfs, the Railway goods yards, and the local markets and houses around the gasworks, would be their stomping ground for generations, right through the two World Wars and beyond into modern times. They brought in cousins from Shoreditch and Spitalfields, with the men working as Tinmen, Rag and Bone men, as well as second-hand clothes dealers, and later as travelling Cutlers, all fanning out into Southwest London and the surrounding areas, giving them stability and a place to call home. Some of the younger Cockney Gypsy men would drive the Dray Horses for the Wagons of the Breweries (Young’s beer from Wandsworth being famous in London) and the women would go to work in the breweries and carbonated drinks factories that grew up in Wandsworth, washing bottles, sticking labels to bottles, bottling beer, and packing bottles, and some would hawk goods for sale on the streets under the guidance of the core Family of Joseph Henry and Cora Christmas. The connections with the Romanies on Wandsworth Common and perhaps back over in Hackney, meant that a swift trade could be had in goods in and out town, and no doubt in and out of the Thames Wharfs, Railway Depots, and Postal returns offices, where goods would sometimes fall off the backs of boats and carts, to be “liberated” by the local Cockneys (some of my own ancestors worked on the railways in Nine Elms, so I can talk with some experience here). 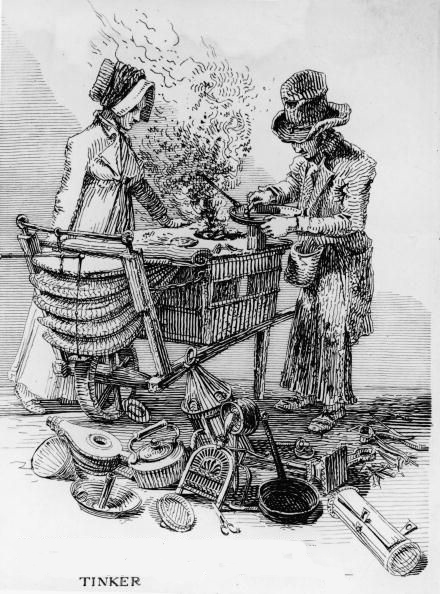 This grey trade had nothing to do with being Cockneys or Gypsies, but everything to do with the poor not wanting to die in the workhouse or on a cold pavement, and putting family before a system that poured scorn on them and their efforts to keep body and soul together. But it can be argued that having suffered, being hardened working class Cockneys, and with the Romani connections, just made them better at it than most people. And good luck to them. A much better sentiment, as I’m sure you’ll agree, summing up the working class Cockney attitude towards accepting begrudged charity, rather than making ends meet by their courage and wits. Joseph Henry’s eldest boy, another Joseph Henry, born in 1873 in Westminster, carried on his forefather’s trades; a travelling Cutler like his Father, graduating to a Rag Merchant. Joseph Henry eventually becomes a General Dealer as his younger brothers learned the trade of Cutlers and Rag and Bone Men, helping their father on his travels, and Joseph Henry on the home streets of Battersea and Wandsworth. Into this heady mix of Working Class entrepreneurs would come the Spall family, all the way from Suffolk, by way of Peckham and Camberwell, through the Transpontine Cockney filter of South East London, to land in Battersea, where Timothy Spall’s Grandfather Thomas James William Spall, a Brewers Labourer and Carman (horse and cart driver) would meet Margaret Christmas, the Rag and Bone Man’s daughter working in the Bottling Factory. They would marry before he went to war as a driver in the Army Service Corps in 1914. And as befits a Christmas story, despite some ups and downs (one son died in WW2 in Italy) the family lived as happily ever after as a working class Cockney Family could, Thomas through to 1960 and Margaret to 1972. There are still some Christmases in London, but few of them know their Cockney Gypsy roots, or their connections to a great British actor, Timothy Spall. “Mary” Christmas to all my readers!